Tressa Sularz, a fiber artist with a strong emphasis on contemporary basketry, lives and works in her home studio in Northeast Minneapolis. Her work reflects movement and transitions – from curving forms suggesting movement, embellished with earthly stones suggesting timelessness to cocoons reflecting on a time of stillness and inwardness with eventual rejuvenation. This current body of work is very personal, reflecting on a year of serious health issues, and finding strength through creativity. My art has always been organically intertwined with my life. Toward the end of 2013 I was diagnosed with cancer. After numerous surgeries, chemotherapy, and radiation treatments, I found myself dancing back to life again. This period has been loaded with challenges, and was a time for healing. Because of some physical limitations, a new body of work evolved. I left my comfortable world of rattan baskets, and began working with new complex techniques and different materials. The scale of my work transformed also. I am very energized with my new work, and look forward to each day when I can begin working. Creative energy abounds. My recent work is growing into more sculptural forms. I’m learning to listen to the materials and techniques, and follow my heart. The graceful shapes reflect a new-found, hard-won grace in life. Sularz has over 36 published designs reflecting her own unique style. Her work is seen in Beyond Basketry, Billie Ruth Sudduth’s Baskets: A Book for Makers and Collectors, Fiberarts Design Book 7, 500 Baskets, and All Things Considered VIII. 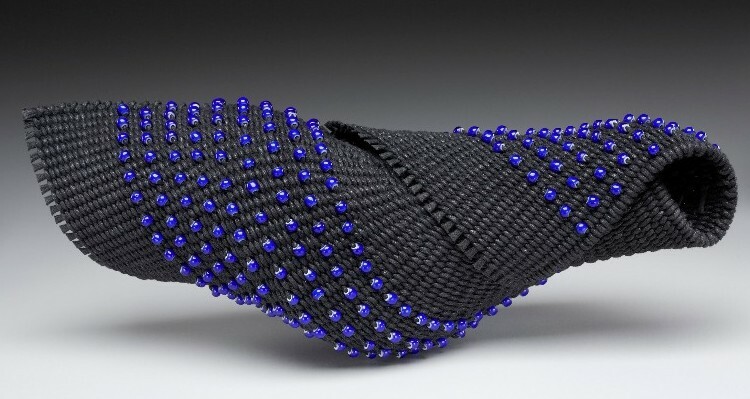 She is a featured artist in the National Basketry Organization Quarterly Review, Fall 2015. She also has pieces in the permanent collection of the Goldstein Gallery, University of Minnesota, and other private collections. Textile Center exhibitions are generously supported by the Joan Mondale Endowment. Photo: The Bluebird of Happiness, Photography by Peter Lee.